DAVI’S WAY is a departure for famous Hollywood villain Robert Davi. It’s a documentary showing his struggles to celebrate the 100th birthday of the great pop music singer Frank Sinatra by recreating Sinatra’s acclaimed 1974 Madison Square Garden performance. 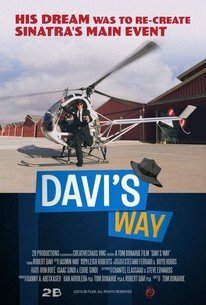 DAVI’S WAY is a very accurate portrayal of Hollywood personalities and stars, featuring an excellent musical performance, but there’s a surplusage of foul language and some violent, inappropriate scenes from Robert Davi’s movies. DAVI’S WAY is a departure for famous Hollywood villain Robert Davi. It’s a documentary showing his struggles to celebrate the 100th birthday of the great pop music singer Frank Sinatra by recreating Sinatra’s acclaimed 1974 Madison Square Garden performance. Both Robert and Sinatra were from Italian families and started out as opera singers. Robert ended up being a villain in a Sinatra movie, CHERRY STREET, and going on to play many more bad guy parts because, as he said, his face was tough and scarred. However, Davi’s true love has always been singing, especially Frank Sinatra’s songs. He’s not just an imitator of Sinatra, he invests Sinatra’s songs with new life. With the help of a renowned Hollywood producer, Danny A, short for Abeckaser, who helps him produce the show and bankroll it, Davi goes on a quest to fulfill his dream. Danny gets an out-of-work actor, Stevie Guttman, to be his assistant. Stevie hopes this will launch his career in Hollywood. One of Davi’s three daughters, Ariana, also hopes it will launch her career. Putting together the recreation of Sinatra’s concert, nicknamed The Main Event, isn’t easy. Along the way, Davi suffers many trials and tribulations and finally ends up in a famous but very small venue in Hollywood. The show is good, and Davi is terrific, but it goes on too long, and he’s forced off the stage. Davi constantly gives good advice to Stevie about how tough the entertainment industry is, but he’s also too hard on Stevie. The movie also reflects on the cultural impact of Frank Sinatra and the songs he sang. Having grown up in the entertainment industry, I found DAVI’S WAY to be a very accurate portrayal of Hollywood personalities and stars. The hopes that come crashing down, the dreams that turn out to be nightmares, the visions that go dark in a tough world. All of those tragic elements, however, make the movie worth watching, except for the fact that there’s a surplusage of obscenities, many of which are “f” words. What’s good, however, is Robert’s perseverance, his wonderful, talented singing of Sinatra, and his deep love for his family. He does treat Stevie with some disdain, although at the end he shows him his appreciation. There are some scenes from Robert’s movies playing gangsters with extreme violence, and pointblank shootings, as well as scenes from movies like SHOWGIRLS with sexually inappropriate language. So, the movie can best be described as a raw documentary portrait of the underside of the entertainment industry. DAVI’S WAY is a departure for famous Hollywood villain Robert Davi. This documentary shows his struggles to celebrate the 100th birthday of the great singer Frank Sinatra by recreating Sinatra’s acclaimed 1974 Madison Square Garden performance. Davi’s true love has always been singing, especially Frank Sinatra’s songs. He doesn’t just imitate Sinatra, he invests Sinatra’s songs with new life. With the help of a renowned Hollywood producer, who helps him produce and bankroll the show, Davi goes on a quest to fulfill his dream. DAVI’S WAY is a very accurate portrayal of Hollywood personalities and stars. The hopes that come crashing down, the dreams that turn out to be nightmares, the visions that go dark in a tough world. All of those tragic elements make the movie worth watching, except for the fact that there’s a surplusage of obscenities, many of which are “f” words. What’s good, however, is Robert’s perseverance, his wonderful, talented singing of Sinatra, and his deep love for his family. DAVI’S WAY is a raw documentary portrait of the underside of the entertainment industry, with an excellent musical performance.